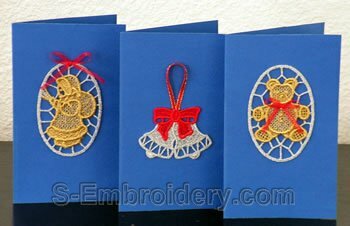 A fine set of 5 Christmas freestanding lace machine embroidery designs. 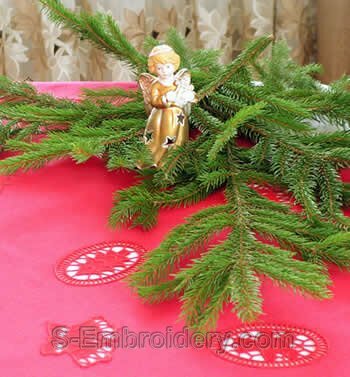 The bear, the Christmas tree, the Christmas candle and the Santa Claus lace embroideries are available in 3 variants and each variant is available in 2 sizes. The variants of the Christmas bells are available in 3 sizes. So, you will receive the set with a total of 30 machine embroidery files. The designs from this set would make perfect Christmas ornaments. 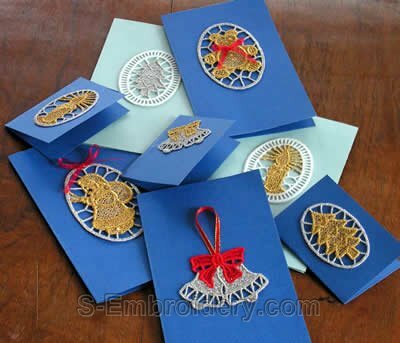 You could use these freestanding lace embroideries to decorate your Christmas tree or your Christmas greetings cards. You could also use them to create a fine Christmas tablecloth. Examples are available on the images further down this page. Information provided here about the number of stitches and size is for the largest designs.The smaller designs will fit the 4x4 hoops. The bear Christmas ornament design is available in 3 variants, each in 2 sizes. This design is offered in 2 variants, each of them in 3 sizes. The Christmas candle freestanding lace ornament is available in 3 variants, each in 2 sizes. 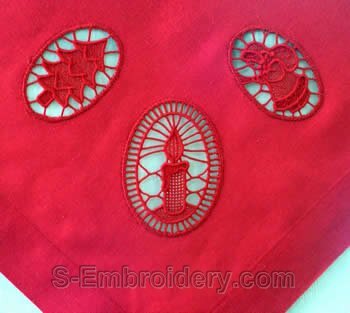 The Santa Claus free standing lace design is available in 3 variants, each in 2 sizes. 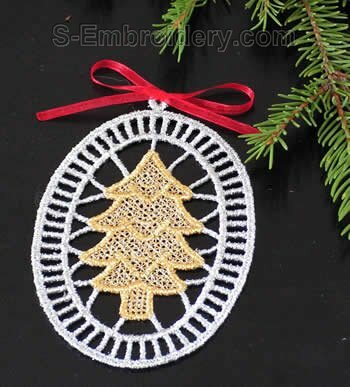 The Christmas tree freestanding lace embroidery design is available in 3 variants, each in 2 sizes.